The "X-Men: Legacy" #268 cover suggests the Phoenix Force could be targeting more than one mutant! 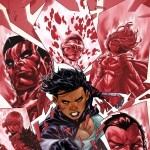 So what will the X-Men do after "Age of X" wraps up? This issue tries to figure that out.